European cities are leading the way with new approaches to innovation. From supporting technology and research ecosystems, to adopting citizen-driven policymaking and promoting bottom-up solutions to climate change and other societal challenges, urban areas have proven a unique capacity to connect people, businesses and places. The European Capital of Innovation Award is an annual initiative by the European Commission to recognise the most innovative cities in Europe — those pushing the boundaries of innovation, and changing citizen's lives for the better. -Strengthen the city's potential to attract talents, resources, funding, investments, acting as role model for other cities. In addition to the title of the European Capital of Innovation, the Commission nominates a number of Runners-Up and Finalists Cities, encouraging local administrations to collaborate between each other and continue on the road towards innovation. 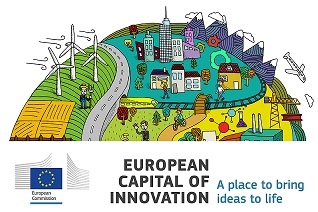 The winning city will be named European Capital of Innovation 2018 and receive a monetary award of EUR 1 million. Five Runner-Up cities will be awarded EUR 100 000 each for their outstanding contributions to promoting innovation. All winners will be announced in November at the Web Summit 2018 in Lisbon. Applications are open until 21st June 2018 via the Commission's Directorate-General Research & Innovation's Participant Portal.